AIR2018 is a multi-disciplinary conference that aims to bring together leaders, professionals and researchers in both academia and industry from Malaysia and around the world. The conference is focused on the Manufacturing and Process Engineering sector and promises an innovative twist in its approach. Unlike conventional academic conferences, this event is tailored for participants from both industrial sector as well as academia. 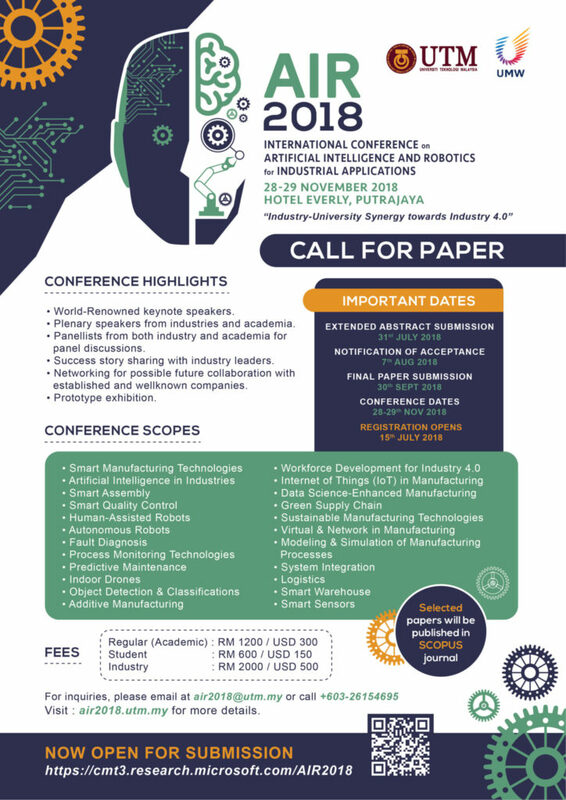 As its theme suggests, the overall purpose of AIR2018 is to strengthen the cooperation between universities and industries as well as Smart Manufacturing and Process Engineering. The conference features keynotes by distinguished speakers, plenary sessions and panel discussion by industrial leaders, and a number of paper presentations by the academia that are related to industrial applications.